This is a copy of my most recent article for SFist in which I eat my way around the Bay Area in alphabetical order and then write about it in SFist style using the 'royal we'. This week we are on the letter N. In keeping with this week's IMBB#19 theme, note that Nook caters for meat eaters, vegetarians and vegans. How's that for a refreshing approach?! Because they have free Wi-Fi connection, we could have written this review live from Nook. But, despite our internet addiction, we prefer to travel with a simple moleskin notebook (no lines). Nook is a quirky little cafe identified by rosy splashes of colour and warm red and dark woods that brightly fill the space previously occupied by a quiet but cool-looking architects office. (Lets hope they just moved on instead of under.) Shoot for the best spot: There are banquettes around the edge of the room that afford the best opportunities for nosing at the other customers. 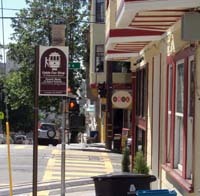 If you are in a more day-dreamy mood then the window seats are particularly appealing, especially if the warm afternoon sun is grazing through the glass at just the right angle so that the heat melts onto your skin and you can gaze out idly at the Hyde Street Cable Cars clunking on by. No fewer than five laptops were present during the hour or so we happily whiled away at Nook, but the people hidden behind their fold away screens are less interesting when you can't manage to shift your seat into a strategic position to get a ganders at what they are surfing. If we were trying to write a novel, this Cafe would have been a sparse hunting ground for characters although we were slightly intrigued by one youngster, his nose adorned with a cattlehorn piercing, his head topped with a Panama-style hat and the rest of his mysteries hidden in an old, worn, leather carpet bag. Unfortunately he, and his female companion left before we'd had a chance to weave a tale about what secrets and stories they might be carrying within their holdall. Like the staff, who for some reason reminded us of intriguing runaways from a circus, the menu is rather unique, containing eclectic and welcome surprises like the highlighted inclusion of vegan dishes, even though it is not a vegetarian Cafe per se. Despite the healthful stance, Nook don't refrain from serving meat and hence I chose some Artichoke bottoms filled with baked goat cheese wrapped in prosciutto di parma for a late lunch. It was a nice idea but nothing spectacular.It was no more or less than its description suggested. We wished we'd ordered one of the other tasty sounding dishes. We should think to remember that we aren't too keen on preserved artichokes next time we eat out. We couldn't resist the lure of the sinful looking vegan chocolate cake with its outrageously thick fondant covering and we were almost amazed that this moist, heavy, chocolatey cake contained none of the usual buttery, creamy ingredients associated with a such a delightful looking dessert. This cafe is licenced, so cocktails were in order. A Bellini, however, with its sweet, orange (not white) peach-juice base, was only so-so, so next time we'll stick to unalduterated Prosecco instead. Nook stage a Happy Hour every day between the hours and five and other alcoholic choices include soju and sake mixed drinks and a wine selection. Coffees, a large selection served in an even larger cup, are also available for when you need a fix of caffeine. We used to live just a block from the Nook spot and, oh, how we wish this cute little neighbourhood place had existed back then. We have no doubt we would have been regular customers at this friendly little corner spot. If you live in the hood, or are passing through Russian Hill and need to check mail on your laptop, Nook would be a worthy, comfortable place to stop. Nook is open every day for breakfast, lunch and dinner. PS. It's IMBB#19 Vegan week here on Becks and Posh. You still have until tomorrow, September 30th, to post up your entry about Vegan food. Read how to enter here. That is what the chocolate cake I made was like... it is soooooooooo ez to. The cake looks amazing. As I read, I was filling in your next comment in my mind that it was frighteningly dry...Im so glad I was wrong! Is you blog coming back??? ?